There is some thing very refreshing and life-like about fruits and bringing this aura into your living space is possible if you consider our range of Fruit Arts décor items. Diligently using oil painted over wood, these artistic creations offer a unique opportunity to render the living room, dining area, or the kitchen spread a more outdoorsy feel, complete with elaborately painted fruits of all types. 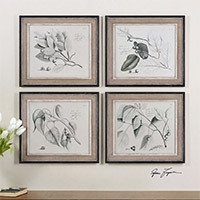 Hang them sensibly on the walls of your dining space or even the passageways/ doorways and you are sure to add a distinct character to the décor. Available in both black & white and colorful patterns, you can use these Fruit Arts as a gift item too. We use our expertise in bringing to you a tempting concoction of fruit arts décor additions that are relevant for nearly every type of setting. There is nothing too loud or outlandish about our assortment of fruit arts options. Depicting nature in its purest, most sacred form, these evergreen decorative items make the surroundings look more welcoming. Our amazing packaging and delivery process ensures that you receive your favorite Fruit Arts safely and in great condition. Fruit Arts There are 2 products.